The Vision iNext has a large, upright version of BMW's kidney grille with a butterfly design. 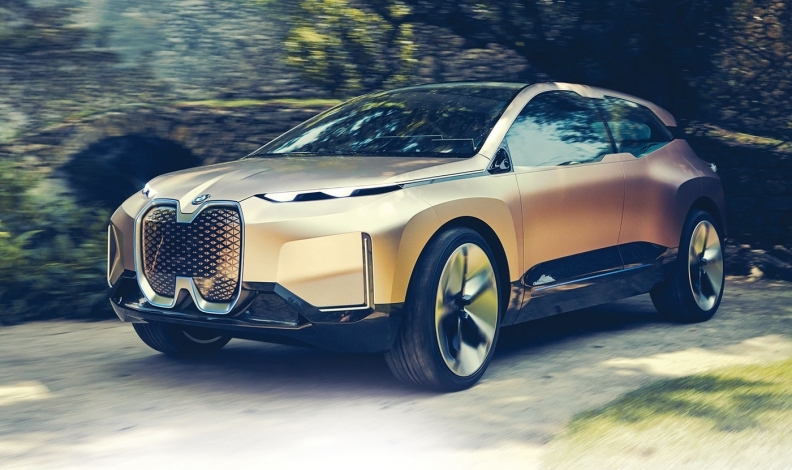 MUNICH – BMW's Vision iNext crossover concept showcases the automaker's ideas about how autonomous, connectivity and electric drivetrain technologies will be integrated into a flagship car planned to launch in 2021. 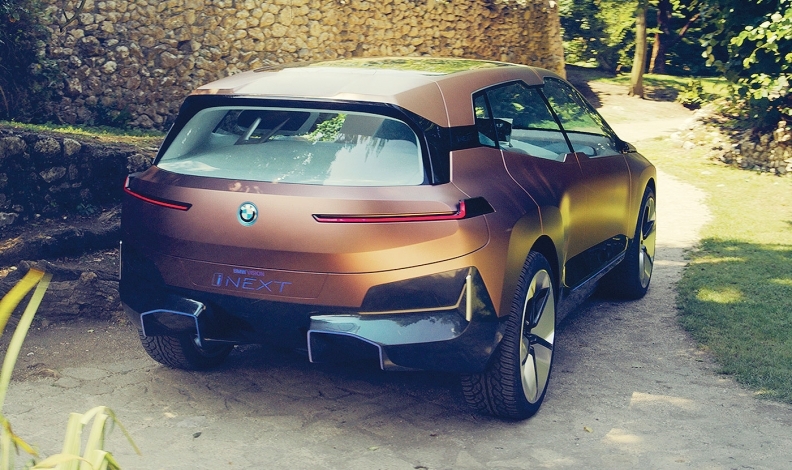 BMW released pictures and details of the Vision iNext on Sunday after taking the concept on a global preview tour for the media earlier this month aboard a Lufthansa Boeing 777F cargo plane that stopped in Munich, New York, San Francisco and Beijing. The Vision iNext "defines our future of mobility," Klaus Froehlich, BMW's development chief said at the Munich preview. "It's our trailblazer for all the strategic innovations we are heavily working on." The production iNext will be a flagship for BMW’s i subbrand. Its innovations eventually will migrate to the rest of the automaker's lineup. The production car will not have the highest level of autonomy, Level 5, which allows the car to steer itself in all circumstances. It will have Level 3, so-called "conditional automation," enabling the vehicle to drive autonomously on highways and in an emergency, pull over and bring itself to a standstill. Drivers must supervise the system and be ready to take back control. "What we can guarantee as a worldwide offer will be a Level 3 system which will be very advanced, so for example on the motorway it will handle at least 130 kph (81 mph) and a lot of maneuvers that you do not discuss at the moment with Level 3 systems," Froehlich said. The Vision iNext's rear design is primed to optimize aerodynamics. It includes an integrated spoiler, narrow edges defined by slim LED taillights and a prominent diffuser, thanks to the lack of exhaust pipes. The production iNext will be powered by BMW's fifth-generation eDrive electric drivetrain and batteries. It will have a driving range far exceeding 600 km (373 miles) under the Worldwide Harmonized Light Vehicle Test Procedure just introduced in Europe for type approval. BMW did not disclose the U.S. EPA range. BMW hopes to power the iNext with higher density batteries and expandable packs as battery technology improves. The Vision iNext has smart fabrics in the cabin, touch-sensitive door handles and an artificial intelligence-driven infotainment system. 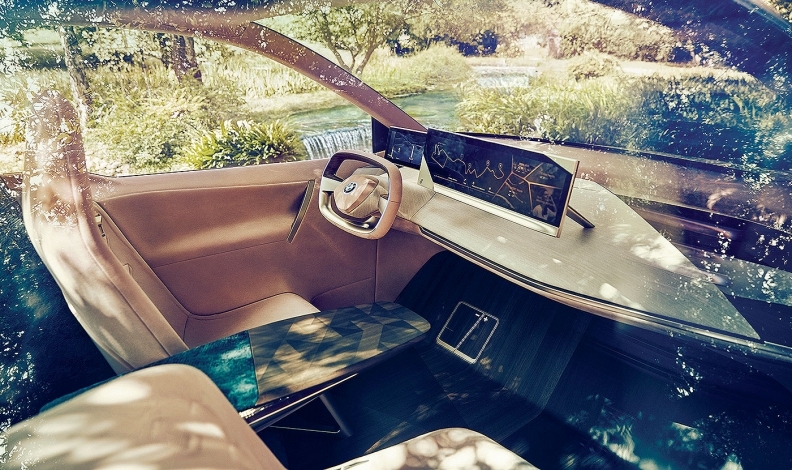 The cabin is intended to create a lounge-like atmosphere that BMW hopes customers will come to regard as a favorite space – "like your living room at home, and not for traveling from A to B only," Froehlich said. Designers say the cabin’s relaxed look was inspired by boutique hotels. To give the interior a feeling of spaciousness the concept lacks the B-pillar typically found on the side of the car to provide structural integrity in the event of a side collision. The front of the cabin has a warm rose-gold color to differentiate itself from the rear which is decorated in shimmering sea blue. The result is a welcoming environment for all occupants. Rear-seat passengers can control media via the seat fabric. Other automakers have produced autonomous concepts with front seats that can swivel around to face the rear when the car is driving itself. The Vision iNext keeps the traditional fixed forward-facing layout. BMW says this is a safer option because cars are designed to protect occupants in seats that face forward. Drivers can also take back control of the vehicle faster if they are facing forward. Apart from the two minimalistic cockpit screens for the driver, Vision iNext doesn't have any discernible human-machine interface. Designers preferred to introduce "shy tech," which refers to unobtrusive functionality that melts into the background when not needed. "As technology become more complicated we want the user interface to become simpler, more user friendly and intuitive," said BMW Group design chief Adrian van Hooydonk. "We want the technology only to be visible when you need it, when you want it." For example, in "Boost" mode, the steering wheel and displays are positioned toward the driver. When its autonomous system is engaged in 2Ease" mode, the steering wheel retracts somewhat and pedals retreat into the floor. Display panels switch from driving-related content to "Exploration Mode," which provides the driver and passengers with suggestions of places and events in the surrounding area that could be of interest to them. If passengers in the second row want to listen to music, they can draw a treble clef with their fingertip on the fabric of the seat. Light emitting diodes in the special tapestry-like “Jacquard” weave trace the movement, recognizing the symbol, and relay the instruction to the onboard computer to play a song list. The driver has a central armrest with a wood panel element that functions as an HMI surface. The Vision iNEXT's center armrest resembles a coffee table, but the wood panel lets humans interact with the vehicle. The concept's voice control system works via natural language, BMW said, although the prototype's battery had been depleted to the point where it could no longer operate during the demonstration in Munich, executives said. The Vision iNext's more unusual interior features are unlikely make it into production. The passenger cabin is intended to enliven the debate about what the interior might look like in the future, executives said. The Vision iNext's public debut will be at the Los Angeles auto show in November. It won't be at next month's Paris show, where BMW is saving its marketing guns for the new 3 series. The iNext will be produced in Dingolfing, Germany, home of BMW's lead production center for battery technologies and e-drives. Froehlich expects that the Vision iNext will have amassed 240 million validated km by its series launch in 2021. About 95 percent of that validation will be done via computer simulation and the rest on roads. To do that testing, BMW is building a data center capable of handling more than 200 petabytes of data. BMW aims to test a more advanced "urban pilot" in geo-fenced trials based on the same architecture as in Vision iNext starting in 2021. This would allow for autonomy up to Level 5 where the vehicle’s self-driving system can operate in all traffic and weather conditions.